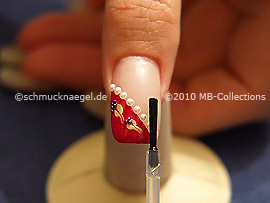 Half pearls and nail art bouillons – Step by step French pull method instruction. Cut one piece clear adhesive tape. 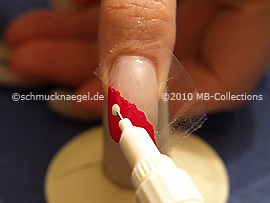 Take up that piece of the tape with the tweezers and stick it on the fingernail. 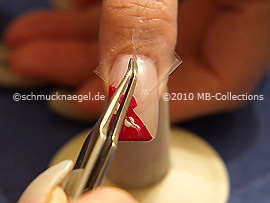 Press with the tweezers the tape firmly to the surface of the fingernail. Now paint the free fingernail surface with the nail lacquer in the colour fuchsia. Paint another layer nail lacquer on the first layer which is already dried. If you use bright nail lacquer, you should always paint another layer in the same colour, so that the nail surface does not through-gleam. 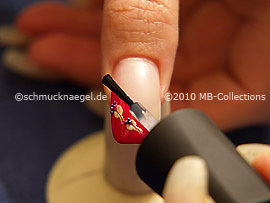 You have to continue with step 4, before the nail lacquer is dried. 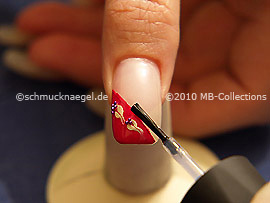 Draw with the nail art pen in the colour white two points on the damp nail lacquer. Now draw with the spot-swirl or a toothpick a line by the center of the white points. The motif with half pearls and nail art bouillons should correspond approximately to the picture. 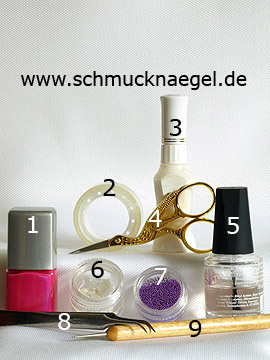 Before you continue with step 5, wait until the nail lacquer on the fingernail is dried. 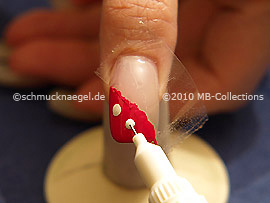 Now remove carefully with the tweezers the clear adhesive tape. 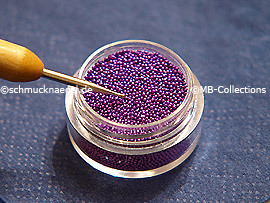 Paint to the upper end of the white points each one drop of clear nail lacquer for the nail art bouillons in lavender. Moisten easily the tip of the spot-swirl or the toothpick and dip the tip into the container with the nail art bouillons in lavender. Now set carefully the nail art bouillons on the damp clear nail lacquer. 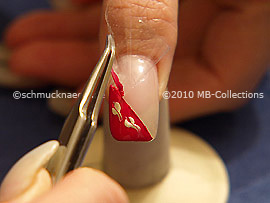 Before you continue with step 7, wait until the clear nail lacquer on the fingernail is dried. 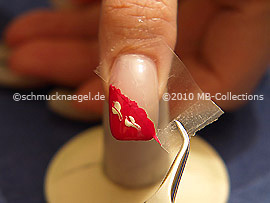 Paint on the transition of the nail laquer and the free nail surface a thin layer of the clear nail lacquer, as attachment for the half pearls. Moisten easily the tip of the spot-swirl or a toothpick and take up a half pearl, which should stick to the tip. Now set the half pearl on the damp clear nail lacquer. Repeat the procedure for further half pearls. 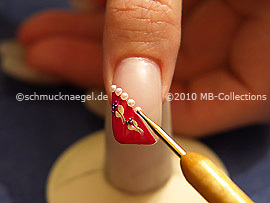 The nail art motif with half pearls and nail art bouillons should correspond approximately to the picture. 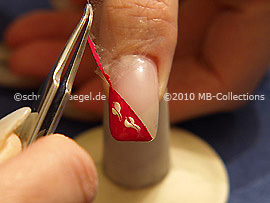 Before you continue with the last step, wait until the clear nail lacquer on the fingernail is dried. 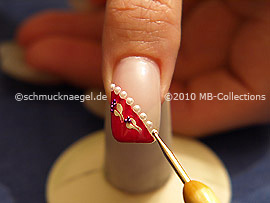 After the clear nail lacquer is dried, the nail art motif with half pearls and nail art bouillons is finished. Half pearls and nail art bouillons was last modified: November 22nd, 2016 by Make it Smart e.K. Half pearls, Nail art bouillons, Nail art pen, Nail polish, Spot-Swirl.